I've had a great run collecting Transformers but it's time to move on. After much contemplation, I've decided I want to finish off my collection with a piece so memorable, so truly special that it will be something worthy of the honor of being my very last Transformer. It will be a figure that when I look at it on the shelf I will cry because it embodies the emotional significance of the end of my Transformers journey. It will remind me forevermore of how wonderful my life was made over the past 30 years by Hasbro's special recipe of little robotic puzzle people made from plastic and metal and rubber. It will be the capstone of my Transformers collection and my rite of passage into a true manhood where I collect only old Macross models from Bandai. And so I have decided Masterpiece Bumblebee will be the last Transformer I ever buy. 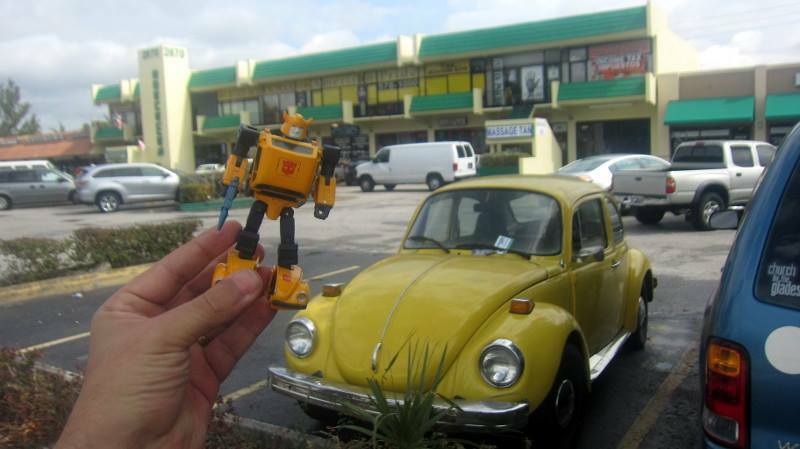 Ah, Bumblebee-I think his TechSpecs said he was the weakest and smallest of all the Autobots. I remember back in 1984 my scrawny fourth grade self loved Bumblebee because I was a lot like him. His being wimpy in a world of giants very much reflected my childhood. I related to the guy. He toughed it out being small and he made it okay to turn into a Volkswagen, which I figured was some complicated metaphor for runty kids like me being forced to wear ugly sweaters by my mom. Through his adventures in the early issues of the Marvel Transformers comic I was introduced to the world of warring robots from Cybertron. His character is forever special to me and this toy is a perfect bookend to my collection. I'm as sure that I'm done with Transformers as I am certain that that no better version of Bumblebee will ever be made. So it is with great pride and humility that I have decided Masterpiece Bumblebee is the very last Transformer I will ever buy.